Kedah ([kəˈdɑh]; Jawi: قدح), also known by its honorific, Darul Aman or "Abode of Peace", is a state of Malaysia, located in the northwestern part of Peninsular Malaysia. The state covers a total area of over 9,000 km², and it consists of the mainland and Langkawi. 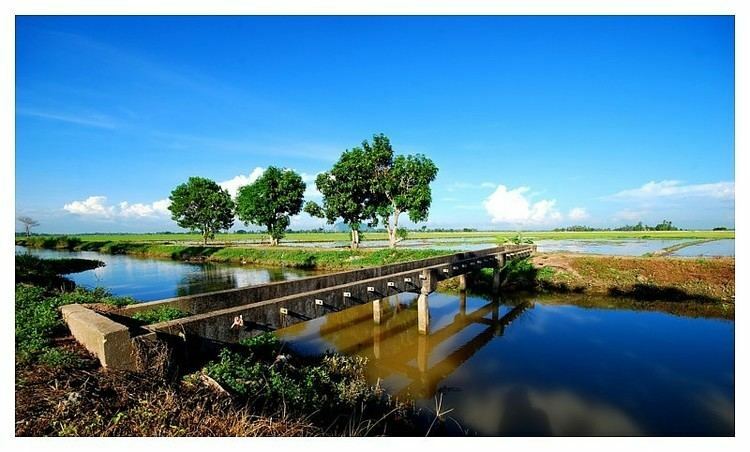 The mainland has a relatively flat terrain, which is used to grow rice. Langkawi is an archipelago of islands, most of which are uninhabited. Kedah was called Kadaram (Tamil: காடாரம்; kādaram) by ancient and medieval Tamil people and Syburi (Thai: ไทรบุรี; rtgs: Sai Buri) by the Siamese when it was under their influence. 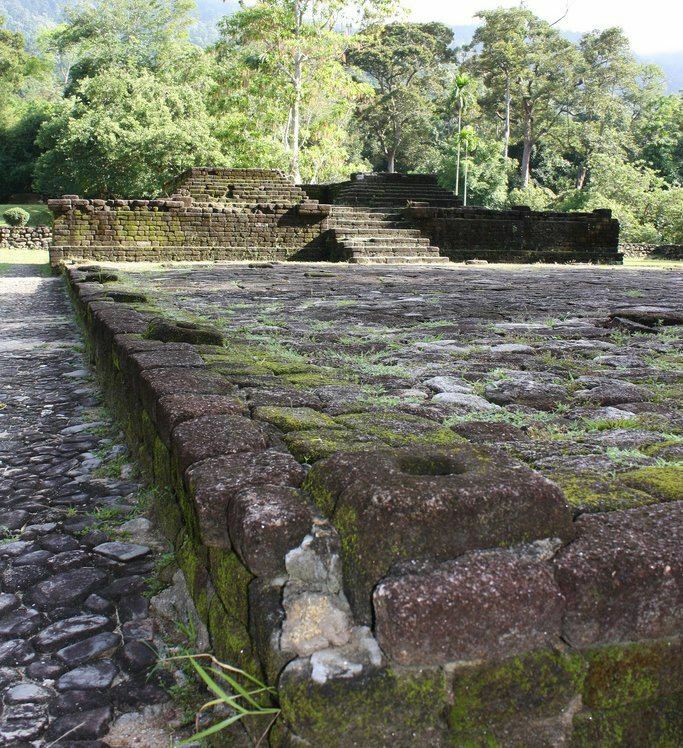 Archaeological evidence found in Bujang Valley reveals that a Hindu–Buddhist kingdom ruled ancient Kedah possibly as early as 110 A.D. The discovery of temples, jetty remains, iron smelting sites, and clay brick monuments dating back to 110 A.D shows that a maritime trading route with south Indian Tamil kingdoms was already established since that time. The discoveries in Bujang Valley also made the ancient Kedah as the oldest civilisation of Southeast Asia. Reference to ancient Kedah was first mentioned in a Tamil poem Paṭṭiṉappālai written at the end of the 2nd century A.D. It described goods from Kadaram "heaped together in the broad streets" of Chola capital. Other than Kadaram, Kedah was known with different names at varying times in Indian literature; Kataha-Nagara (in Kaumudi Mahotsava drama), Anda-Kataha (in Agni Purana), Kataha-Dvipa (in Samarāiccakahā), and Kataha (in Kathasaritsagara). In the middle eastern literature, ancient Kedah was referred as Qilah by Ibn Khordadbeh in Kitāb al Masālik w'al Mamālik, Kalah-Bar by Soleiman Siraf & Abu Zaid al Hassan in Silsilat-al-Tawarikh (travels in Asia), and Kalah by Abu-Dulaf Misa'r Ibn Muhalhil in Al-Risalah al-thaniyah. The famous Tang dynasty Buddhist monk, Yi Jing who visited Malay archipelago between 688–695, also mentioned about a kingdom known as Ka-Cha in the northern part of Malay peninsular, which according to him was 30 days sail from Bogha (Palembang), the capital of Sribogha (Srivijaya). According to Hikayat Merong Mahawangsa or the Kedah Annals, Kedah was founded by a Hindu king named Merong Mahawangsa. According to the text further, the Sultanate of Kedah started in year 1136 when King Phra Ong Mahawangsa converted to Islam and adopted the name Sultan Mudzafar Shah. In the 7th and 8th centuries, Kedah was under the loose control of Srivijaya,. In 1025, the city was conquered by Rajendra Chola, the Chola king from Coromandel in South India, who occupied it for some time. A second invasion was led by Virarajendra Chola of the Chola dynasty who conquered Kedah in the late 11th century. During the reign of Kulothunga Chola I Chola overlordship was established over the Sri Vijaya province Kedah in the late 11th century. 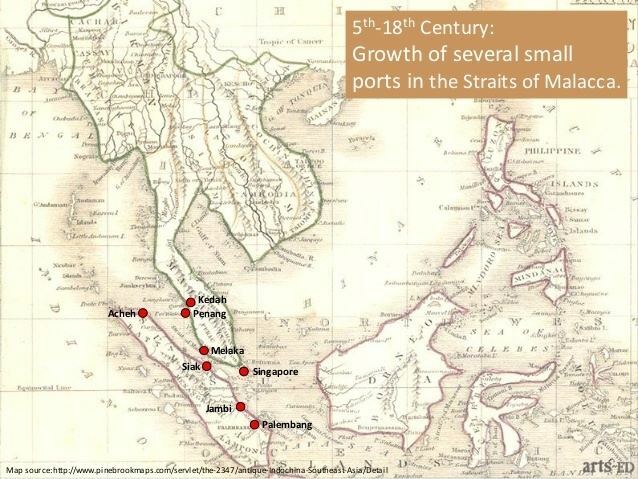 It was later under Siam, until it was conquered by the Malay sultanate of Malacca in the 15th century. In the 17th century, Kedah was attacked by the Portuguese after their conquest of Malacca, and by Aceh. In the hope that Great Britain would protect what remained of Kedah from Siam, the sultan handed over Penang and then Province Wellesley to the British at the end of the 18th century. The Siamese nevertheless invaded Kedah in 1821, and it remained under Siamese control under the name of Syburi. In 1896, Kedah along with Perlis and Satun was combined into the Siamese province of Monthon Syburi which lasted until transferred to the British by the Anglo-Siamese Treaty of 1909. Since 1958, the hereditary Sultan of Kedah has been Tuanku Abdul Halim Mu'adzam Shah. The Kedah Sultanate began when the 9th Kedah Maharaja Derbar Raja or Phra Ong Mahawangsa, converted to Islam and changed his name to Sultan Mudzafar Shah I. Since then there have been 27 Sultans who ruled Kedah. Kedah is the 8th largest state by land area and 8th most populated state in Malaysia, with a total land area of 9,500 km2 (3,700 sq mi), and a population of 1,890,098. The Pedu Lake is the largest man-made lake in the state. Kedah has a relatively heterogeneous populace constituted by three major ethnic groups; the Malays, Chinese and Indians as well as some Malaysian Siamese ethnic groups, similar to most of the other Malaysian states. Prior to the formation of the Federation of Malaya, there was an ethnic group known as the Sam Sam people. They are culturally Malay Muslim but speak Siamese language. Most of these communities are almost extinct due to assimilation with the Malays. In some places in Kedah, the Sam Sam people still retain their Siamese language as their mother tongue. These communities can be found in Pendang District, Kuala Nerang District and Kubang Pasu District (Changlun, Kodiang, Jitra, Wang Tepus, Guar Napai, Malau, Ason and Napoh). Kedah has a very small Orang Asli community. Orang Asli only can be found in the Baling district. Kedah is a multilingual state with various spoken indigenous and non-indigenous languages. Kedah also has its own distinct variety of Malay, Kedah Malay or Pelat Utagha as it is known by locals. Kedah Malay is divided into several mutually intelligible dialects which also span outside of Kedah to Satun (Thailand), Perlis and Penang. Another distinct variant of Malay is Baling Malay which is closer to East Coast Malay languages such as Kelantan-Pattani Malay and Terengganu Malay than to Kedah Malay. Besides Malay varieties, other indigenous languages in Kedah belongs to the Aslian (spoken by the Orang Aslis) branch which is unrelated to Malay, which include Jahai, Kensiu and Kintaq. The Kedah Siamese language was spoken by Siamese communities across the state and has broad differences from the Thai Language and Kelantanese Siamese. The population of Kedah in 2015 was 2,071,900. It was made up of 76% Bumiputra (Malays and others), 12.7% Chinese, 6.9% Indian, 0.9% others and 3.4% non-Malaysian. The following is based on 2015 figures from the Department of Statistics Malaysia. As of 2010 the population of Kedah is 77.2% Muslim, 14.2% Buddhist, 6.7% Hindu, 0.8% Christian, 0.3% Taoist or Chinese religion followers, 0.7% followers of other religions, and 0.1% non-religious. Kedah's Constitution was promulgated by its Ruler in July 1950. The various provisions laid down in the Constitution include the role and powers of the Monarch, the State Parliament and the State's Civil Service. The Sultan of Kedah is the constitutional ruler of the State. His position is hereditary and he holds office for life. The Ruler is the head of the religion of Islam in the State and the executive power of the state government is vested in him. The current Sultan is Sultan Abdul Halim of Kedah, who has reigned since 1958. The State Executive Council, which along with the Sultan is Kedah's executive branch of government. It is composed of the Menteri Besar, who is its chairman and Kedah's head of government, and ten other members. The Menteri Besar and other members of the council are appointed by the Sultan of Kedah from members of the Dewan Undangan Negeri (State Assembly). The state also has a legislative branch, called the State assembly. It is similar to the Parliament but is limited to making laws relating to the state. Its members are elected in elections which are usually held simultaneously with federal elections. The term of each state assembly member is limited to five years. The state assembly must be dissolved before or once it expires its term for a fresh election to elect its members. Kedah is considered the "rice bowl" (Malay: Jelapang Padi) of Malaysia, accounting for about half of Malaysia's total production of rice. In 2008, the state government banned the conversion of paddy fields to housing and industrial lots to protect the rice industry. Tourism, particularly on the island of Langkawi is of growing importance. More recently, Kedah has forged its economy towards the automotive and aerospace industries with Modenas and Asian Composites setting up bases here. One of the main advantages is the low labour costs and the infrastructure in place with the North–South Expressway and the Penang International Airport close by. In 1996, the Kulim Hi-Tech Park (KHTP) was officially opened as the first high technology industrial park in Malaysia. The Park comprises a total land area of approximately 14.5 square kilometres (5.6 mi²). According to the Ninth Malaysia Plan, this economic area is part of the Northern Corridor Economic Region (NCER). The Northern Corridor Economic Region is one of three development regions formed in Peninsular Malaysia; other development regions being the Iskandar Malaysia (or South Johor Economic Region) and the East Coast Development Region. The state has a campus of Universiti Utara Malaysia (UUM), which is located in Bandar Baru Sintok. It was formally incorporated on 16 February 1984. The University was established with the specific mission of providing a leadership role for management education in the country. The academic establishments in UUM include College of Business (COB), College of Law, Government and International Studies (COLGIS) and College of Arts and Sciences (CAS). Kedah also has several public universities and colleges such as Universiti Teknologi MARA (UiTM) in Merbok, the Malaysian Spanish Institute of Universiti Kuala Lumpur (UniKL MSI) and the Polytechnic Institute of Sultanah Bahiyah (PSB) in Kulim, the Asian Institute of Medicine, Science and Technology (AIMST University) in Bedong, Kolej Universiti Insaniah (KUIN) in Mergong and the Polytechnic Institute of Sultan Abdul Halim Mu'adzam Shah (POLIMAS) in Jitra. There are 2 teacher training institution in Kedah, Institut Pendidikan Guru Kampus Sultan Abdul Halim (IPGKSAH) in Sungai Petani and Institut Pendidikan Guru Kampus Darul Aman (IPGKDA) in Bandar Darulaman that are set up by the government to provide teaching courses for trainee teachers. Private universities and colleges that are located in Kedah include the Open University of Malaysia (OUM) Regional Learning Center for the state of Kedah and Perlis at Sungai Petani, the Albukhary International University in Alor Setar, Pusat Bahasa Titian Jaya the PTPL College and the Cosmopoint College. Kedah houses three technical institutes that are affiliated with MARA, that is Institut Kemahiran MARA Sungai Petani, Institut Kemahiran MARA Alor Setar and Institut Kemahiran MARA Sik. This state also has several boarding schools such as Sekolah Berasrama Penuh and MARA Junior Science College or MRSM. Consists of several private and public primary school or secondary school. Public secondary school such as SMK Taman Jelutong, Keat Hwa Secondary School, Convent Secondary School (Formerly known as St. Nicholas Convent Secondary School), Kolej Sultan Abdul Hamid,Sekolah Menengah Kebangsaan Sultan Badlishah, Sin Min Secondary School, Chio Min Secondary School,SMK Sultanah Asma, SMK Convent Father Barre, SMK Khir Johari, SMK Aman Jaya, SMK Bedong, SMK Bakar Arang, SMK Darulaman, SMK Ibrahim, K Jit, SMK Mahsuri, SMK Tunku Panglima Besar, Keat Hwa Secondary School, SMK Guar Chempedak, etc. Private secondary school such as Keat Hwa High School, Sin Min High School and SM Sin Min. Tourism is mainly concentrated on Langkawi Island, the largest island in the archipelago. There are some places of interest on the mainland as well. The Langkawi International Airport is located at Padang Matsirat and it is also considered a tourist attraction as the Langkawi International Maritime and Aerospace Exhibition takes place every 2 years near the airport. The airport handled almost 1.2 million passengers and over 41,000 aircraft movements in 2008. It serves as the primary gateway into Langkawi. In 2007, Langkawi Island was given a World Geopark status by UNESCO. In 2006, Kedah hosted the 11th Sukma Games. The opening and closing ceremonies were held at the Darul Aman Stadium in Alor Setar.